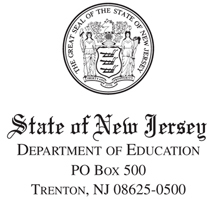 This Personal/Relative Disclosure Statement is required annually of all school officials in accordance with N.J.S.A. 18A:12-21 et seq., The School Ethics Act. The Relative Disclosure Statement must be filed by April 30th of each year or within 30 days of assuming office or position if newly elected or appointed. This statement is a public record. Before completing this statement, read all instructions and definitions. 1. Is any person related to you, or related to you by marriage, employed by the school district or a charter school in which you hold office or are employed? If you are an employee of the NJSBA, is any person so related to you employed by any school district or charter school? If yes, please provide the information requested below. If no so certify. I answer no to this question. 2. Are you or is any person related to you or related to you by marriage, a party to a contract with your school district or a charter school? If you are an employee of the NJSBA, are you or is any person so related to you, a party to a contract with any school district? If yes, please provide the information requested below. If no so certify. 3. Do you or does any relative receive compensation from or have any interest in any business which is a party to a contract with the school district or charter school in which you hold office or are employed? If you are an employee of the NJSBA, do you or does any relative receive compensation from or hold an interest in any business which is a party to a contract with any district? If yes, provide the name of each business and if applicable, school district. If no so certify. This Financial Disclosure Statement is required annually of all school officials in accordance with N.J.S.A. 18A:12-21 et seq., The School Ethics Act. The Act requires that information pertain to the preceding calendar year. The Financial Disclosure Statement must be filed by April 30th of each year or within 30 days of assuming office or position if newly elected or appointed. This statement is a public record. Before completing this statement, read all instructions and definitions. If the information has changed from the preceding calendar year, it is recommended that the official also provide financial information which is current as of five days prior to the date of this filing. 1. List the name and address of each source of income, earned or unearned, from which you or a member of your immediate family received in excess of $2,000. If a publicly traded security is the source of income, the security need not be reported unless you or a member of your immediate family has an interest in the business organization. If you are a district employee, be sure to list the district board or charter school as a source of income. Client fees received through a business need not be separately reported. 2. List the name and address of each source of fees/honorariums or gifts/reimbursements or prepaid expenses having an aggregate amount exceeding $250 from any single source, excluding relatives, received by you or an immediate family member. Be sure to list any reimbursement received from the district or charter school for such things as conference attendance, tuition/dues reimbursement, personal appearances, speeches, or writing. 3. List the name and address of all business organizations in which you or a member of your immediate family held an interest during the preceding calendar year. I understand that this certification constitutes my representation of the accuracy of its contents. I hereby certify that these disclosure statements contain no willful misstatement or omission of material fact and constitute a full disclosure with respect to all matters required by N.J.S.A. 18A:12-21 et seq. I am aware that if I fail to file a statement or if I file a statement containing information that I know to be false, I shall be subject to disciplinary action up to and including removal pursuant to N.J.S.A. 18A:12-29.